This is my gaming PC. I call it the “beast” because it features AMD’s fastest, meanest, best FX processor ever! The mighty FX-9590 8-Core CPU! In addition, you can see I’ve installed an R9 295X2 GPU – the other beast, since it is the fastest graphics processor you can buy! As for the final touch, I’ve added Red LEDs to ensure it shines beautifully in the dark! Fantastic rig, along with nicely guided and neatly managed cabling, good job! I noticed an incorrect component listing within your specifications in regards to your power supply that I thought you may not have noticed. In the specifications, you have a Fractal Design Tesla R2 800W Power Supply yet, in the image you clearly have an EVGA 1300W G2 Super Nova. I figured you may want to correct your listing to correspond with your actual specifications. 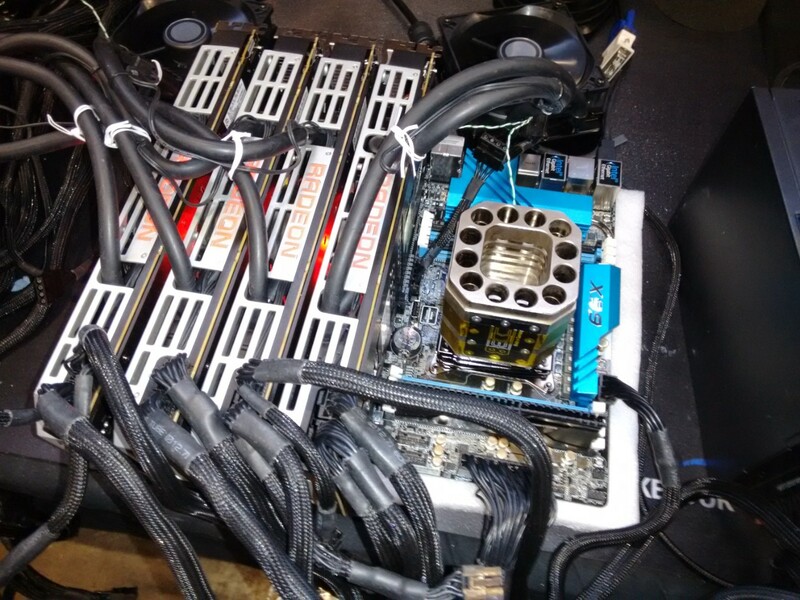 Wouldn't want you to leave that beastly psu out of the mix! I have the same psu and it's price to performance is amazing! Anyways, another discrepancy I noticed is your gpu is listed as a PowerColor Turbo-duo Radeon R9 290X yet, within the image you have a Radeon R9 295x2 which, is also stated as such in the description. Last but, not least in the description you have your cpu listed as an AMD FX-9590 yet, in the specifications you have your cpu listed as an AMD FX-8350 Unclocked Processor. Anyways, thought you'd like to now, great rig once again and I wish you well. Have a nice day. First I'd like to thank you for the compliment and being part of this community. My name is Sam (AMD's Community Manager)...nice to emeet you! Second, and to be completely honest with you , the above rig belongs to one of our Red Team Plus members. His name is Benedict Corpuz (@superben). I used his rig as an example since it's one of my favorites. I will share your message with him as I'm sure he'll be flattered by it. I just love The Red Beast. That is the second one I have seen I believe. Doesn't matter, it is GREAT!!! yeah. looks like same used my old rig specs and my new rig picture. I'll update pretty soon with my own posts. You mean to say "Looks like Sam used my old rig spec...", right? ;-) I'm guilty as charged. I look forward to your own post Ben. That sure is one powerful monster to love! I will stick with my R9 290 until i'm taking a trip to Fiji. Skip Fiji and wait until HBM2 in presumably 2016. Depending on its price i may even go for a CrossFire setup! I'm sure everyone would love to see Fiji in a CrossFire setup. By the way, did you see the HBM blog? Yea, and I was going to stick with my 7970 until Fiji, until AMD announced the successors of Fiji due in 2016 which will feature HBM2 with doubled speeds and quadrupled capacity (HBM1 caps at 4GB, HBM2 caps at 16GB), and will also be manufactured on the much more efficient FinFET process over 20nm of Fiji. Come then I'll buy the water cooled x90X and possibly upgrade my CPU as well if it works in my Sabertooth 990FX Gen3/R2. I know AMD had to generate hype, but I think they may have shot themselves in the foot a bit. However, if current speculation holds that the 390 and 390X will be the only new cards this year with the 290X being rebranded to the 380X and so forth, they won't have a stockpile of cards to liquidate. I'm sure Fiji will impress, and I'd love to have one, but I don't have the money to upgrade every year, and it'll most likely be 2017 before I can afford a 490X. I hear you :-) I normally upgrade my PC every other year. When I do, I try to future-proof as much as possible to ensure my rig will run smoothly for as long as possible. I'm a gamer and have reasonable standards when it comes to gaming - as long as I can run games at high setting I'm happy. It always seems like that there is absolutely no competitive strategy - and thats very sad. Because consumers will always rate a product based on the general public opinion. In none of these points I feel "satisfied" at the moment. At least the points 1&2 may can be satisfied with Fiji and HBM, point 3-5 would require just 2 people which know what they are doing. I hate the free game ¢rap. Between my 7970 and FX-8350, I got "over $250 worth of games" (as advertised at the time) that I never even used. I'd much rather AMD just give a coupon for a game or half the value on a prepaid card. Usability for consumers could be improved by removing that ¢rapware Raptr completely and updating CCC from 2006, as well as integrating some of the features into it so we won't have to use third party programs such as Sapphire Trixx or MSI Afterburner. If you want to get the App Profiles, you must install Raptr, something AMD integrated into it presumably to attempt to force people to use it. Note to moderators: ¢rap is not an offensive word in 2015. What is that CPU cooler? It is actually my build. Sam explained that he just used it as an example. Check out my #RadeonRig post for all of the proper info. It's a nice rig, but it's not mine. It belongs to our good friend superben See, I used his rig as an example since it my personal favorite. I wanted to provide everyone an idea for the type of information, picture and description we'd like to have everyone share with the rest of Red Team community. That thing is a beast. Even that PSU is beastly. How many watts does that thing pull down? Really cool and fast system, thanks for posting. One question: Where did you buy a Sapphire motherboard? amazing looking build! I tried to post mine using the form, not sure if I did it correctly and didn't see any place to add a photo of the build. Oh man if I could build with parts like that one day, I'd be giddy like a little kid. WOW....... this PC is a monster omg its so so so... awesome! Very impressive build! My compliments to the "MadMan" who built it..
Wow, this is just fantastic. And the name "The Red Beast" is 100% right in this case. Very nice! thats a nice rig. my one isnt showing up yet as i have to add images. and i dont know how to disclose my personal name. so i adjusted it.